I’m not a libertarian, but I love debating libertarians. Case in point: Bryan Caplan. 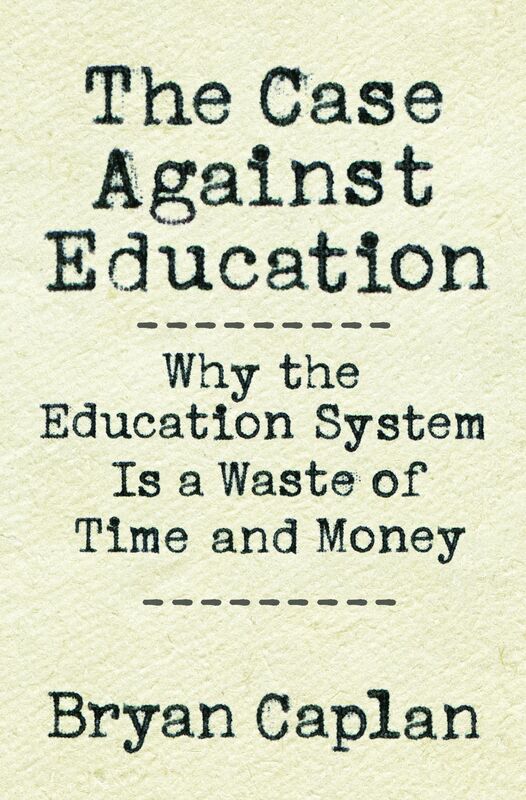 Caplan is an economics professor at George Mason University and the author of a new book, The Case Against Education. In that book he makes a bold argument: Public education is waste of time and money and we should stop investing in it. Caplan marshals a ton of evidence in support of this claim, most of which reinforces his view that what we’re doing now isn’t working that well. I agree with him that our current system is broken, but I’m not convinced we should give up on public education. So I reached out to Caplan and asked him to lay out his argument. You think public education is a massive waste of time and money. I think that’s an egregiously misguided thesis. Tell me why I’m wrong. I’ll admit that saying education is a waste of time and money makes me sound like a mean person. My thesis really does seem to go against good manners about what people are supposed to say and think about education. But here’s my basic argument: Education is a waste of time and money because so much of the payoff for education isn’t really coming from learning useful job skills. Nor is it coming from students savoring the educational experience. Rather, most of what’s going on is that people are showing off — or, as economists call it, they are “signaling.” They are trying to impress future employers by showing how dedicated they are. What we have now is a situation in which a ton of people go to college but many of them don’t get a great job when they’re done. Or they get a lot of education, fall into debt, and then get a mediocre job. Contrast this with the idea we have about college, which is that you receive valuable training, acquire useful skills, and then you’re rewarded with a good job afterward. I have to push back on some of that, but first let’s be clear about your argument: Are we talking about higher education here or are we talking about K-12 education? Or is it all of the above? I want to say all of the above, but we don’t really have that much data for anything before high school. I focused on high school and beyond. Kindergarten through 8th grade tends to serve as a daycare center for kids while their parents are at work. The educational waste really becomes a problem in high school because at that age kids could be doing something far more productive, like an apprenticeship or a vocational school. Here’s where I think we disagree: You think we have too much education, and I think we’re doing education wrong. In other words, you want less education, and I want better education. To me, that’s a lot of what’s going on with education. We’ve got very clear evidence that we’re wasting a lot, but we don’t have a clear idea as to what would be better. All we know is that the system we have now is grossly dysfunctional, so I don’t think we should keep pouring money into it. You keep using the word “waste,” but it’s not clear what you mean. Are you implying that education is a waste if it doesn’t lead to a good job? Well, if education isn’t actually training you for a job and you don’t actually enjoy it, I’d say it’s wasteful. If either you were being trained or you enjoyed it, then I would say, “Well, that’s not wasteful because at least you’re getting one of the two things out of it.” You’re getting either preparation for the future or you’re getting satisfaction, but if you’re not getting either of those things, I think of it as waste. How do you measure all of this in the book? I use the idea of social return, which is a term economists use to describe the value of an investment from a social point of view. They look not just at the benefits and costs to an individual, but also the benefits and costs for everybody in society. It turns out there really wasn’t a lot of good data here. There were plenty of academic papers that looked at education and social returns, but they were so narrow that they really didn’t give a full picture. So that’s what I tried to do in this book. And when you look closely at the social returns for education, and you consider how much of it comes down to signaling, there’s a pretty convincing case to make that what we’re doing now is a terrible social investment. You think of education as a rote technical enterprise, so it’s all about skills and productivity and the labor market. I think a good education is about cultivating wise citizens, people who appreciate democracy, who are discerning and not easily hoodwinked. That we’ve failed to do this doesn’t mean education is a waste of time; it means we’re doing it wrong. I have a whole chapter on these broader social types of education, and you actually say something that almost no one else who makes the argument does, which is that we’ve got to actually look at the empirical evidence and see whether the existing system succeeds. So the question is, do we actually end up turning students into good citizens? Here, there’s quite a bit of evidence that says college doesn’t transform you much politically, and that it doesn’t cultivate good citizens in the way you described above. It’s not that college education doesn’t impact people at all — surely it does. But the effects are a lot smaller than people believe. So when you say that our existing system isn’t working and that we need to transform it, I say, “Where’s the evidence that changing it will help?” And how can we justify all the time and money it will require to change it when we don’t know what works? That’s why I call for a common-sense skepticism and say, “Look, the current system is not delivering, at least not delivering very much.” If someone says that they do have a system that would deliver, it would seem like the burden of proof should be on them to go and demonstrate that it’s working. That something is hard is not an argument against doing it. I say it is. It’s not a decisive argument, but it’s one of the better ones. We’ll agree to disagree on that one. I want to keep pushing on this link between education and democracy. I look at what’s happened in this country in the last few years, and I wonder if any of it would be possible if we actually educated our citizens, if we spent less time shoehorning facts into students and more time defending free inquiry and critical thinking. I just don’t see how the solution to our problem is less education. I completely agree. In fact, that’s a big theme of my first book, The Myth of the Rational Voter. My main response to what you said is: How? How do we teach students how to think? I looked at the educational psychology literature very closely and what I found is that they want to believe that it’s possible to teach people how to think or how to learn but, after 100 years of studying it, they have no idea how to do it. They’re almost in despair about it. But nearly everyone agrees that our existing education system isn’t teaching people how to think, and no one has a magic bullet solution that will fix everything. My feeling is that if a bunch of people want to believe something, and they study it for a long time and still can’t believe in it, that’s pretty strong evidence that it’s not true. You might say, “Maybe if we had 10 times as many educational psychologists, we could finally figure out how to teach people how to think,” but so much energy has gone into this already. So many smart people have tried to twist the problem around and find ways of teaching people how to think, and we just haven’t figured it out. And you think spending less time and money educating people will improve our situation? Yes. I don’t think it would improve our thinking. I think our quality of thinking would stay about the same because I don’t think the current system is improving it, but we would save a lot of resources, and people could start their lives at a much earlier age, which I’d consider a big improvement. There are a ton of resources being wasted right now, resources that could be put to better use elsewhere. I also worry that a massive public disinvestment in education would widen many of the inequalities that already exist in this country. In your ideal world, people with money would continue to receive a good education and the people who don’t would be left further and further behind. That was definitely a concern of mine, but then I did a lot of reading on this and I changed my mind. Here’s a good question to start with: Would you rather be a high school dropout today or in 1945? Exactly. The reason 1945 is better for high school dropouts is that there was no stigma back then because there were just too many of them. People didn’t take it for granted that if you’re a high school dropout, there must be something wrong with you. It was understood that maybe your family didn’t have enough money for college or whatever, but you weren’t dismissed on account of that. You still got a fair shot. Today, because education levels have risen so much and because of the power of the kind of signaling I mentioned earlier, not finishing high school virtually destroys any chance you have of getting an interview for a decent job. Employers can easily dismiss high school dropouts precisely because education levels have increased dramatically. Lay out what you think a perfect education system should look like. I’m a libertarian, and I’ve never disguised that, so my view is that the burden of proof should be on government to ask taxpayers for their money. Of course, this is not most people’s political standpoint and, if you don’t share that same perspective, you’re going to come up with a totally different view. I’m willing to stick my neck out and say that we should have separation of school and state, just like separation of religion and state, and that government should just get out of the business and leave it to customers and charity to handle it. To be clear, this conclusion isn’t implied by the data I cite; this is my personal political philosophy. You make a lot of interesting points in the book, many of which I had not considered before. Ultimately, though, I think you confuse your indictment of the education system as it currently exists with an indictment of education as such. That’s a fine philosophical point. I’d just say that the best predictor of what an education system will be like tomorrow is what it was like yesterday. Our system has been dysfunctional for a really long time, and you say, “Let’s reform it.” I say, “That’s a real long shot.” If our problems were relatively minor, that’d be one thing. But if you think our system is deeply dysfunctional, then saying we’re going to reform it sounds like wishful thinking to me.